If you have healthy gums and jawbones, you are likely a candidate for dental implants. Implants are ideal for replacing missing teeth or creating secure attachments for bridges and dentures. Like other appliances, they help remaining teeth keep their position, provide a solid bite and give you a secure smile. Other teeth don’t need to be altered to accept implants — a large advantage when you’re replacing a single damaged tooth. 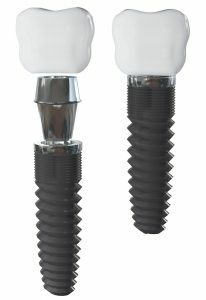 Implants are installed in two parts: first the implant, then the crown is attached to the implant. While dental implants provide a solid, secure form of artificial teeth, they also take time to install. The process takes two to three procedures, depending on the circumstances. First, a metal anchor, usually titanium, is placed in the jaw for each tooth. Anchors must fuse with the bone, a process that takes three to six months. Some anchors include a post, others are integrated with a post later. While you wait for your jaw and gum to heal, your artificial tooth is prepared at a dental laboratory according to exact specifications. Attaching the tooth to the post is the final step. Additional adjustments may be required. Depending on the number of teeth to be attached, this process can take up to a month or slightly more. Secure, comfortable, stable and attractive — dental implants are one of the finest solutions for the problem of missing teeth. Let the dentists at Placerville Dentistry Group help you determine if implants are right for you.